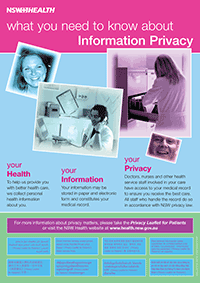 ​The Privacy Poster provides a clear and concise message to patients that NSW Health staff will treat personal health information in accordance with privacy laws. The poster should be displayed in all public areas within NSW Health facilities. The Information Sheet for Staff: Distribution of the NSW Health Privacy Poster and the Privacy Leaflet for Patients provides guidance regarding distribution and display of the Privacy Leaflet for Patients and the Privacy Poster.